The machine is a Modular design to enable suitable extensions /alterations in future. It is an extremely efficient Converting Machine and has been specially designed for our Integrated Project. 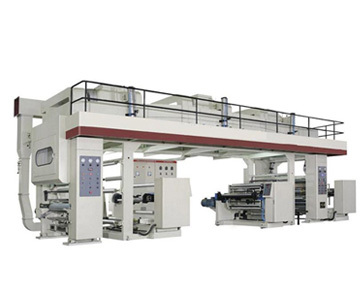 This unique Coating /Laminating Line is suitable for Pre-Coating of Clear Films and Paper for Metalizing and Holographic Embossing, as well for converting Wide Web Holographic Films into Sticker and Hot Stamping Foil. It can also be used for Single Colour Coating of Wide Web Metalized and Holographic Films for manufacturing Packaging Films, Holographic Gift Wraps etc. The Coating and Laminating Line includes a Surface Coating Unit, Drying Chamber, Laminating/Winding Unit and Centralized Control Panel with Heavy Duty Base and Dampers to ensure Vibration Free Operation and Superior Finish. Type of Substrates (Films etc. ): PET, CPP, PVC etc. Working Speed: Up to 60 Meters/minute, Depend upon the Materials. Blower Motors: 2 HP AC – 4 Nos. Coating Unit: Coating Anilox Etching as per your varnish gram weight. Heating Load: 27 KW, with Blower.